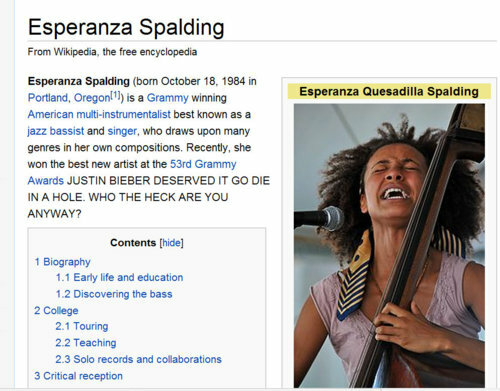 'Esperanza Spalding' Wiki Page Hacked (Photo) By 'Justin Bieber' Fans ! After the 2011 Grammys, many people were left asking, "Who is Esperanza Spalding?" The little known jazz singer took home a 2011 Grammy for Best New Artist, beating out teen pop sensation Justin Bieber. Legions of Justin Bieber fans weren't too happy with the Esperanza Spalding Grammy win. Many took to Twitter to vent about how Justin Bieber should have won a Grammy. Other members of Bieber Nation hacked the Esperanza Spalding Wiki page. First, Esperanza Spalding's middle name was changed to "Quesadilla." The bio on the Esperanza Spalding Wiki page said: "JUSTIN BIEBER DESERVED IT GO DIE IN A HOLE. WHO THE HECK ARE YOU ANYWAY?" Later, some Bieber hater wrote "HaHa Justin Bieber, you're just a little boy with no Grammy for Best New Artist."